At their core, both apps are attempting to do the same thing, provide users with personalized news to get them to read longer and come back for more. They approach the same goals with slightly different ideologies that have long separated Apple and Google. Upon first launching Apple News, you are asked to make a variety of choices including the topics you are interested, and sources that you enjoy reading. This largely makes up what recommendations Apple News presents. Comparatively, Google uses the data it already has on you to populate your news feed as soon as you launch the app and sign in. Actions that can affect these predictions include searching topics in the Google search bar or reading stories in Chrome. Apple does not collect nearly the same level of data that Google does, which can lead to Apple News to be a bit less personalized out of the box. Google, using its massive amounts of data alongside artificial intelligence and machine learning, leads to a bit of a better experience as soon as you launch the app. Both apps have similar tabs along the bottom for navigation, with each taking you to the personalized For You section when you launch. Apple News also has Spotlight, Following, Search and Saved tabs. Spotlight is a collection of highlighted articles of the day as chosen by Apple's human editors. Following, is where users can find more channels, topics, and stories to help personalize their feeds. Search and Saved are fairly straight-forward in their functions. Google News has Headlines, Favorites, and Newsstand alongside the previously mentioned For You section. Headlines seems a bit similar to Apple's Spotlight tab, but is a bit more robust, pulling a variety of stories in many different categories. Favorites, akin to Apple's Following tab, houses all of the topics, sources, locations a user chooses. It is also where saved searches and saves stories live, instead of within their own tab. Newsstand, Google News's last tab, is where all different publications live, including those that use a paywall or require a subscription. Among the things we preferred about Google News, was its Full Coverage feature. The app takes a story topic and presents several different takes on it in forms of swipe-able cards. Top coverage is first available from different sources, then a series of Tweets on the topic, followed by a timeline of events, a few opinion pieces, analysis articles, and then all coverage from several different viewpoints. This all helps users develop their own opinions on a topic, rather than have their preexisting opinion reinforced by only being exposed to outlets they've chosen to follow. Google News, like Apple News, should get even better over time as Google amasses additional data on you. It already does a great job in presenting articles you may want to read. Refining the data by highlighting articles and topics you like and don't like will benefit AI and ML systems that power recommendations. This amount of data pre-collected is disturbing, though. As soon as we logged into the app, the recommended topics were a collection of recent topics we had been searching on Google recently. We're also not excited about the presentation on Google News. Articles look very similar to the AMP articles that are available online, which basically makes them feel like mini web pages. They feel a bit out of place, and not nearly as integrated as Apple News articles do. Apple News as an app feels much more polished, especially while reading articles that have been optimized for Apple News. Images and text can "wipe" in, images are displayed much more cleanly and can go full screen, all leading to a better user experience. We also appreciate the human-touch brought to Apple News through their team of human editors that help pick and choose which stories to feature in the spotlight. Apple has also been diligently fighting for more high-profile exclusives that you won't see in Google News. But, with Apple's lack of personalized data collection, its predictive capabilities are definitely lacking at least at start. Much more user input over time is required to help Apple News decide what to present any given reader, and at times it can feel like not enough new sources are presented. Google News is available now on the App Store, launching May 15 after being announced at Google I/O. Apple News, which debuted with iOS 9, received a major update with iOS 10, and recently saw additional improvements with iOS 11.3. Fair enough. Well, I try to stay away from Google as much as I can, so hopefully they don’t know quite so much about me. Perhaps Apple News will be personalized just as much for me at the start. Apple News versus Google News ...? Let me guess ... One is the news, the other you are the news? I've been a Flipboard fan since it first came out (catch up on my iPad before I go to bed each evening). I follow dozens of blogs, magazines, etc and I like the way it displays the articles. What I don't like is the search and saving functions (I revert to "add to Safari "reading, but the titles don't come through). If Google News is available in Canada, then it already wins for me, because Apple News is not. Why would it be disturbing to be offered news related to topics you've already shown you're interested in via a Google search? That is supposedly the point of the upgrade to Google News. It's more likely you find it interesting and time-efficient if it's doing what it's designed to do. I don't care what the current celebrity du jour said today or wore to the gym and I would hope Google doesn't waste my time with it. AFAIK Google's advertising profile representing "you" is not even all that specific, an assigned ID based on general location (ie zipcode), gender, age range, assumed hobbies and interests derived from search, and where it can be determined marital/family status and estimated family income. That doesn't mean that those folks with Google accounts don't have more connected but still anonymised data in their profile, but no personal identifiable info is shared with an advertiser or website operator like AppleInsider anyway, right? Very informative article tho. I had no clue that the way Google designed this results in news presented in a format less likely to reinforce your existing opinion. They include competing viewpoints as well. That's a huge plus IMO since it largely negates the biggest concern about curated news sources: They tend to become echo chambers. It was not uncommon in centuries past for wealthy people to employ a reader to gather daily news and magazines articles and cull the best according to preferences and often read them aloud at breakfast table. Happy to see that Apple and Google will compete for our attentions. Hopefully others. Who knows? This capability is not one to be taken lightly. Critical during elections, a nation deciding warfare or diplomacy, etc. Glad Apple taking time rolling out internationally. Not holding breath for a China rollout. To add to gatorguy thought, I dislike having to click on 20-30 different articles a day on say apple trying to find the additional one or two nuggets that are useful news to me. If a bot can assemble needles from daily haystacks in one piece, sign me up. Ditto if it alerts me to singular rare pieces. Ironically this example results in less clicks per person and seem like it goes against traditional Google financial model. Its in keeping with motto of organizing information and it could be forerunner of more capable digital assistant. There’s money in that. Google should not be trusted with personal information. Ever. Google must basically just hand their employees iPads and tell them "copy this app"
I tried the new Google news and discovered all of the stories picked out for me were the ones I had visited earlier. Felt a little creepy. I will stick with Apple news since it seems much more random for me. Growing up the evening news and newspapers seemed to cover much more international news than we get today. I visit a lot of world news sites now to remind myself there is a lot more going on in the world. "Comparatively, Google uses the data it already has on you to populate your news feed as soon as you launch the app and sign in. Actions that can affect these predictions include searching topics in the Google search bar or reading stories in Chrome." Some may think this is a convenience, but I don't. Like one of the other readers posted before me, this is a "little creepy". Google released this app only to collect more data. They're not interested in providing a service. At least Apple is up front. They just want to sell us products and services. Apple makes money off of selling their products to consumers and businesses, not by selling my information. I’m also ad-phobic so an adblocker is a must. Also, the “Automatic Reader View” can bypass attempts to block blockers (pressed quickly). At Google News frequently the news is from Washington Post, where they let you read a few articles then ask for cash. At Google News you can copy the link to the article and paste it in Safari’s Private section to bypass. 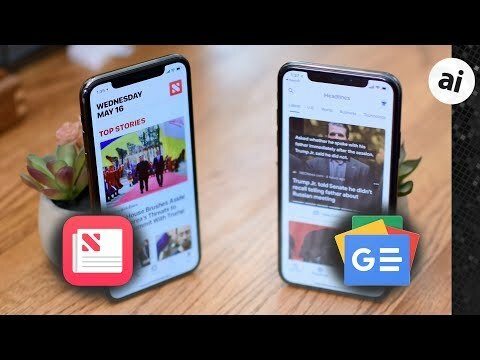 I have a shortcut directly to news.google.com on the Home screen, so there’s no need for an App. Also, within the apps they’re tracking you. So use a VPN and Safari gives you more privacy (if desired). FYI... Apple uses Google's servers to store your info. So it's regardless of how you say "little" info Apple collects. Consumers choose your poison wisely. I would assume you would have to otherwise how can it personalize the news to you? It just wouldn't work as well. Google Assistant wouldn't work as well as if it didn't have a lot of data on you also. I really don't want a news app to know very much about me at all. I like that I can pick news sources and themes, but for an app to select what I 'should be' interested in based on my profile is exactly what I do NOT want. The last thing I want when reading the news is a bunch of articles and editorials that have been chosen because I am likely to agree with them. If I am in favour of a party, or a politician, why would I only want to read stories that support my views? I am not going to select (in my case) Fox as a news source, but I still like to be challenged. I threw out Apple news for that reason and haven't replaced it with anything else. I try to go directly to a few primary sources. I feel like Google is far too profitable to have such bad marketing, by which I mean all their name changes. Are their first run name just trial versions until they work out the inks and then go with the name that most closely resembles Apple's naming convention? What are you talking about? Google News has existed since 2002, long before the iPhone.